101 Posts Tagged "wide world of blog"
Perhaps your head is exploding with all the new stuff coming out of every electronic orifice. It might be useful to consider how you go about getting your dose? Maybe it’s RSS, it might be clicking every link shared by a Jedi master, or slogging through the plaff of twitter, heck it might even be from a magazine. I have a technique that never fails to give me a lift (when it works), yet I can hardly claim it is reproducible. It’s equivalent to kicking over a rock when hiking just to see what might be hiding underneath, when you find something cool (or just as not, squishy) in an expected place. For a while I have been saying I should keep track of all the useful or interesting things I have found online by sheer serendipity. The best part is the surprise factor, and that it is very likely something that is not in everyone else’s news feed. One source that works occasionally is scanning the links people put in their e-mail footers. Sure mostly it is their blog, or their company, or their math department.. but quite often people put links in their footer to something they are truly passionate about. When the listservs I read are dull, I scan the footers. Okay, 20 grains is pretty small, but spell a lot of words right and…. 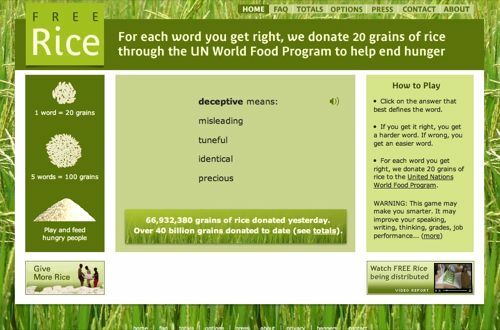 But its a great concept that ties together two unrelated goals (getting “smarter” and feeding the world) in a clever way. OMG, my sides are aching from laughter, just me and my web browser and the GraphJam site which is taglined “Pop cullture for people in cubicles”. People submit Excel generated charts and graphs that illustrate sayings, song topics, or just relationships of things from history or modern life (Found this in the latest issue of WiRed). Shouldn’t I Be More Suspicious?